That sounds corny, I know and Ally knows it too – she said it to me this morning after I texted her my results. JP and I had been talking about what we thought our results would be while we were driving to the club that owns the BodPod. 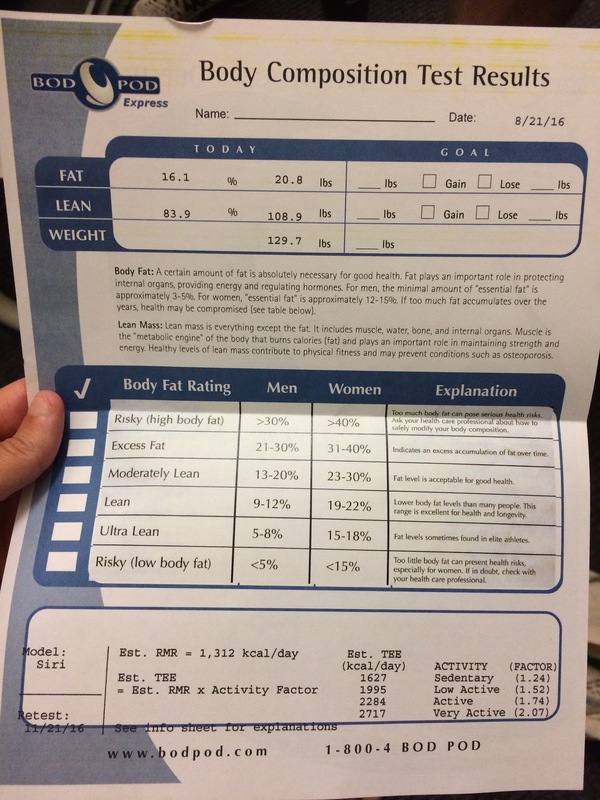 I told him I thought I was probably around 18% because realistically I had surgery, I was on bed rest and my lifts weren’t where they were in the spring during the summer. I said there’s potential that even though I’m lighter by the scale that I’m up a few percentage points. That’s normal, but I want to know where I am so I can be more strategic going forward. 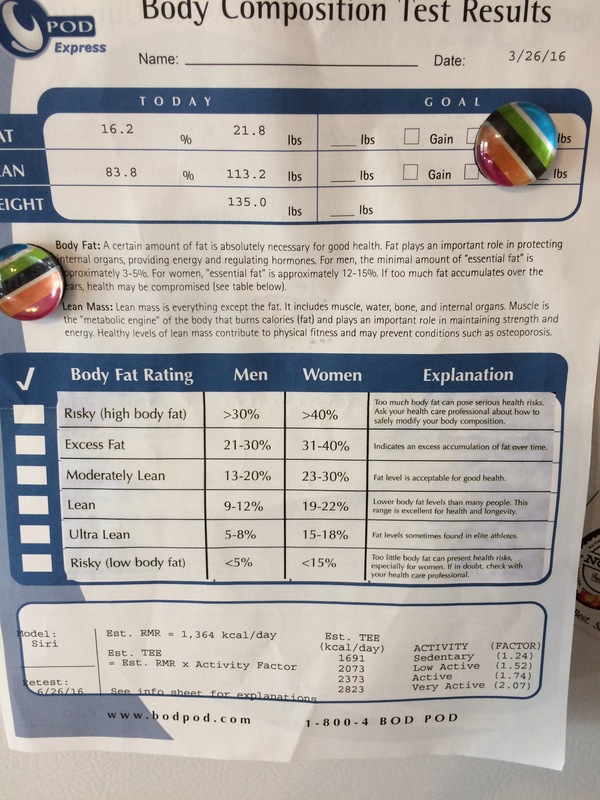 I wasn’t expecting 16.1% body fat. For reference here’s my spring results. They were done in March when I was about 2 and a half, almost 3 months into prep. I weighed 135 pounds. Today according to their scale I weighed 129.7 pounds. I’m down .1% point from the spring, with a full pound of fat lost. I also lost some lean muscle mass, but again, according to their scale, there’s a 5.3 pounds difference between these two readings. As Ally explained to me this morning, the ratio of lean to fat is really good and it was probably maintained because even though I reversed slightly before surgery and started to reverse post surgery – nutritionally, I was in a deficit still and I could’ve potentially pushed further calorically. No wonder I can see abs most days. Seeing your abdominals means you have a lower body fat percentage, and they typically start becoming visible around 18% body fat for women. Something needs to change. At the bottom of the sheet you can see my RMR or resting metabolic rate. This is how many calories I burn at rest during the day. On the right hand side you see a list of calories and activity levels. While I’m lifting 6 days a week and for the past 3 weeks had cardio scheduled 3 times a week as well, I don’t know if I would truly believe that my body is being very active. I do have a desk job and sitting during the day has an impact on your body. 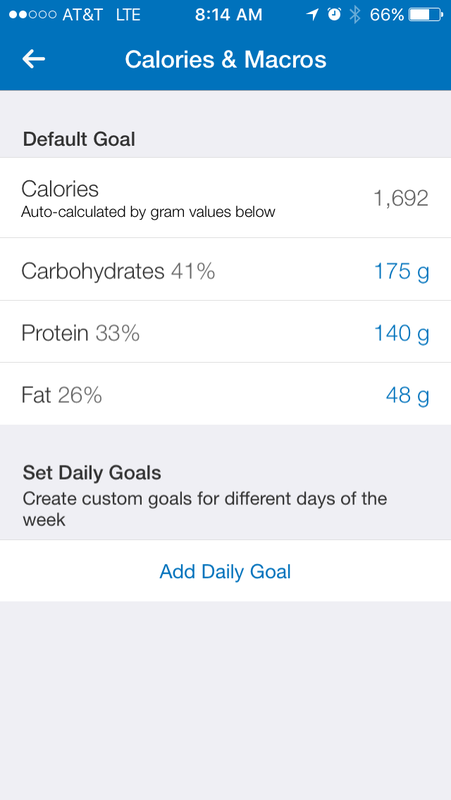 I would believe that I probably have close to the active caloric daily expenditure of 2,284 calories. I have a really good starting place and time on my side. Easy as that. I started a volume block this morning. The past 3 weeks I had been working on lifting heavier, getting my strength back to where it was and having a little bit of fun with some different structure. Strength blocks are necessary because they can help shape your body differently than a volume block. My volume block focuses on the opposite – a little lighter weight with more reps. This block my daily reps for a total workout will be between 300-400. Today’s leg day was 340 reps from 28 sets. Legs are going to be toast in the morning. Cardio – I like running. I like the stair stepper. I don’t mind cardio, but I also don’t love it. It’s a necessary evil though for weightloss, fatloss and overall being healthy. The past 3 weeks I’ve had 3 cardio days: steady for 20 minutes, tabata or HIIT for 15 and intervals for 15. Last week I decided to move my cardio sessions to during my lunch hour, if time allowed, this also allowed me to increase the time of my sessions slightly. I added 5 minutes to steady and 10 minutes to HIIT or Tabata. Last week I cardio’d for a total of 65 minutes. To help increase my deficit without having to adjust nutrition too much, I’m adding a 4th day of cardio – 10 minutes of HIIT. So my cardio schedule will look like this: Monday – 25 minutes of HIIT or Tabata, Tuesday – 15 minutes of intervals , Thursday – 25 minutes of steady and Friday – 10 minutes of HIIT. A total of 75 minutes. Nutritionally – I love food. Don’t get it twisted. I like volume food, I like dense food. Pass the 80/20 beef burger this way. If it fits my macros, I’m probably going to eat it, but I’m also serious about my goals and that means that this will be slightly effected this week as well. To help the cut nutritionally, I’m lowering my fat by 2g or 18 calories, I’m also lowering carbohydrates by 5g of 20 calories. This brings my macros down to: 48F/175C/140P or 1,692 calories. Again, still a ton of food. Pancake Monday and Waffle Wednesday can still fit, I can also supplement with a 1 carb waffle for volume. Many of the veggies that I love can also provide volume – broccoli and cauliflower were on sale this past week – you should see my freezer! Having a slight caloric deficit and a deficit created by my activity level should help progress. I’ve said on Instagram that it is frustrating not seeing the scale move, but when I’ve done side by side comparisons there’s a difference. I’m tighter and leaner and after today’s test, I’m not really concerned like I was before about leaning out. There’s 10 weeks until show day, 9 weeks until peak week. There’s time for adjustments and trust me there will be adjustments – that’s how this sport goes. I’m excited about what I learned because it’ll help me be more strategic to get me into a deficit more effectively without feeling like I’m in the gym for the whole day or that I’m missing out on foods. Sadly, JP leaves tonight and we’re not sure if he’ll be visiting until September. We do know we will be home for our 2 year anniversary on September 9th. Happily though, that means I can eat how I need to without taking his reverse into consideration or if he wants to have date day. I just need to focus on my meal prep and planning and my own work schedule. Which by the way is taking me to New Jersey on Tuesday night and I’ll be back on Wednesday afternoon. This won’t effect my workouts at all, but it does mean that when I’m prepping tonight I will need to research where I will be and make plans for what I can pack with me. I will probably have waffles in my 6 pack bag because Waffle Wednesday is life, unless interrupted by doughnuts. Anyway, we’re going to head to the poolside in the backyard, then to the airport. Let’s get this week started!